This archived Web page remains online for reference, research or recordkeeping purposes. This page will not be altered or updated. Web pages that are archived on the Internet are not subject to the Government of Canada Web Standards. As per the Communications Policy of the Government of Canada, you can request alternate formats of this page on the Contact Us page. Prince Edward Island was a colony of 87 000 people when it joined Canada in 1873. The Island's economy depended on farming, timber and shipbuilding. There was a strong trading partnership with New England in the United States. The first problem was a very old one and had to do with land. Landlords who lived in England owned most of the Island. This meant that settlers could not buy their own land and had to rent it at high cost. 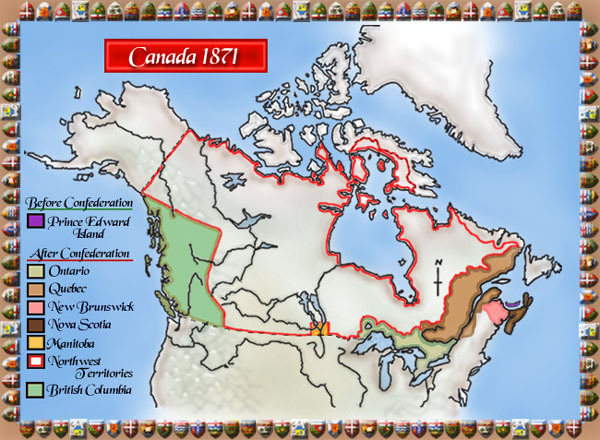 Canada agreed to help by buying the land from the landlords so that settlers could then buy and own their land. The Island had borrowed a lot of money to build a railway, and could not pay back its debts. Canada agreed to help them pay this money.